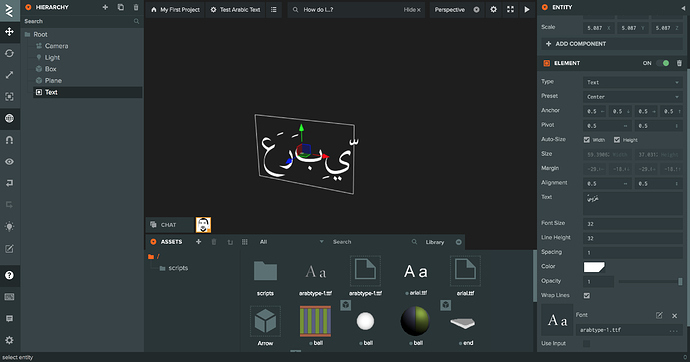 I’m new to PlayCanvas and would like some assistance getting Arabic text showing properly in my project. While Arabic letters do show up, they appear (1) disjointed and (2) from left-to-right. I have added a screenshot and some links below. Does PlayCanvas support Arabic text? Does it support rendering of right-to-left (RTL) languages like Arabic? Please advise. Thanks! We’re looking at supporting Arabic RTL at the moment actually. We’re in an exploratory phase at the moment, but hopefully we can get this implemented in the near future. That’s great to hear! Thanks for your quick reply. As a native Arabic speaker, I can try my best to answer any questions you may have on how to choose the correct Arabic letter form depending on the letter’s state within the text (i.e. by looking at the letter/diacritic/character before and after it) and I can also assist with testing/troubleshooting. Please let me know if I can be of any guidance! Thanks for the help and advice @bsweileh! We’ll be in touch if we need further assistance. Maybe I’m a bit too late, but it worked for me after some trials and errors! Convert Unicode characters in UTF-16, UTF-8, and UTF-32 formats to their Unicode and decimal representations and vice versa. In addition, percent encode/decode URL parameters. The converter happens automatically.